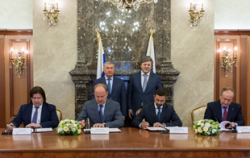 PAO Sovcomflot (SCF Group), Rosneft, the State Transport Leasing Company (STLC), and Zvezda Shipbuilding Complex have signed a set of agreements that entail the construction of five Aframax tankers powered by Liquefied Natural Gas (LNG). The 114,000 dwt vessels will be built by Zvezda jointly with Hyundai Heavy Industries (Republic of Korea) and are scheduled to enter service to enable export shipments of crude oil and oil products from 2021. The tankers will have an ice class of 1A/1B, sufficient to ensure safe year-round operations in regions with challenging ice conditions, including the Baltic Sea and subarctic seas. This series of tankers are purpose-designed to use LNG as their primary fuel, which significantly reduces their environmental impact. The vessels were designed to comply with most stringent international Sulphur Oxide (SOx), Nitrogen Oxide (NOx) and Carbon Dioxide (CO2) emission standards, governed by new IMO regulations that are scheduled to come into effect from 2020 and will apply, amongst other areas, to the Baltic and North Seas.